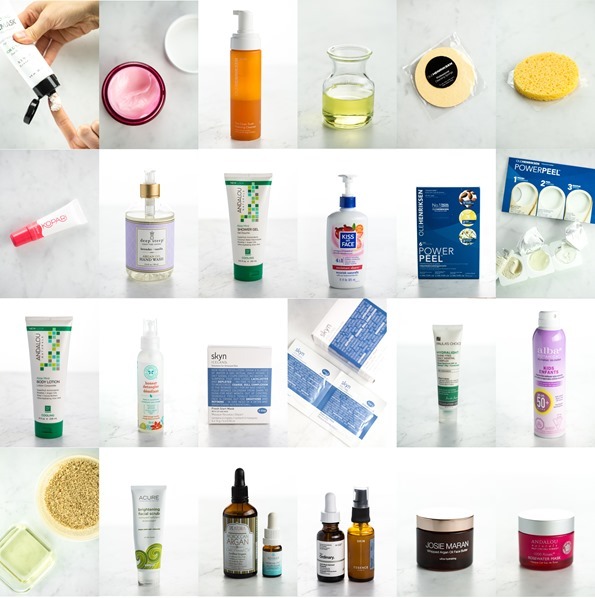 At long last, I’ve put together this page dedicated to my current favourite skin care products. SO EXCITED. It’s something you’ve been asking for for a long time, and I’m so happy it’s finally ready to share. I’m not a skin care pro, just sharing what I personally enjoy! And what I enjoy is always evolving. I love trying out new products and do so fairly often. I’ll try to update this page if any of my faves change. Don’t hesitate to drop me a line below and let me know what your current favourites are, too—I’d love to hear about them! (Though please avoid using links, as they often go to spam.) We can have a big ol’ skin care party up in here! As far as skin care “manifestos” go, mine’s a bit like this: I try to support cruelty-free products with reasonable price points as much as I can (bonus points if they’re local/Canadian companies, too. I’d still like to find more in the future!). I also like to use a combo of homemade and store-bought products. And although I’ll occasionally make an exception if a product is super effective, I try to use products at the lower end of the Environmental Working Group ratings scale. As of June 2017, all of the products below are reported as being cruelty-free. Most are vegan, with a few exceptions (homemade raw honey cleanser, facial sunscreen/moisturizer, power peel). Since companies occasionally change their formulations and partnerships, this info is subject to change. This page is not sponsored, and I have no affiliation with any of the listed brands. Additionally, none of the products were given to me for free. However, there are some affiliate links (through Amazon and Shop Style) below, and I will earn a small commission if you purchase through my page. Thank you in advance for supporting what I do! I receive a lot of offers from consultant-based brands (such as Arbonne, DoTerra, BeautyCounter, etc. ), and while I appreciate them greatly, I’m unable to accept. I’m also unable to answer questions about whether certain products or ingredients are safe to use during pregnancy and breastfeeding. I would suggest consulting with your physician if you have any questions/concerns! Okay, let’s dive in, shall we?! My take: This super-easy homemade scrub is pretty fun. Thanks to The Social for sharing a similar version that inspired me. I keep a stash of ground almonds and avocado or olive oil in my bathroom, and try to use the scrub once every week or two. It leaves my skin glowy and feeling smooth without drying it out! About this product: This facial scrub gently exfoliates and removes dirt and oil, while also nourishing and restoring your skin’s cells. My take: This is a nice all-purpose facial scrub that gets the job done, and I love that it has a beautiful green hue thanks to the French green clay and kelp. I don’t know how “brightening” it is, to be honest, but it’s definitely effective as an exfoliator! And like other Acure products, the price is fair. I use it in the shower since it’s easy to rinse off in there. I tend to let it sit on my skin for several minutes (almost like a mask), and then rinse it off at the end of my shower. I use a few different methods for facial cleansing: store-bought cleansers, oil cleansing, and raw honey cleansing. I’ll talk about each below! About this product: This antioxidant-rich facial cleanser featuring African red tea extract and vitamin C cleanses, hydrates, and refreshes your skin. Though it’s great for all skin types, it’s especially suited for those who suffer from dullness and mild dryness because it removes makeup, oil, and impurities without sucking out your skin’s moisture. My take: At first I was thrown off by the foam as I’ve never been a big fan of foam cleansers, but this cleanser has grown on me. It seems a bit creamier than other foam cleansers I’ve tried. While I can’t say this is the best cleanser I’ve ever used, it’s decent and I appreciate that it doesn’t make my skin feel tight. 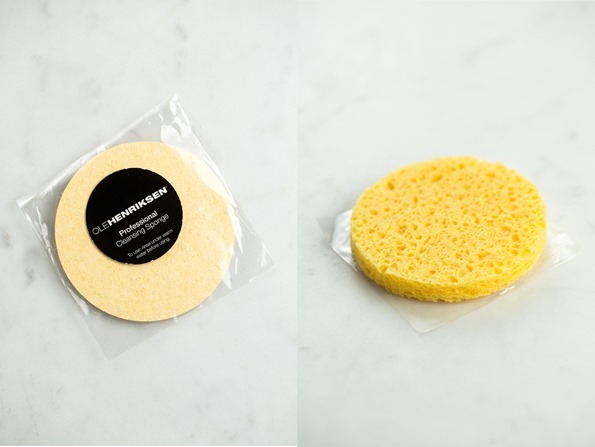 I like pairing it with the Ole Henriksen Complexion Sponge (below), which I believe comes in the Power Peel box (described below). About this method: There are many different methods for oil cleansing, but this is how I personally do it. First, I put on a shower cap to protect my hair. Then I rub a quarter-size amount of olive or avocado oil onto dry skin. (There’s no need to cleanse your skin first as oil is a great makeup remover. However, if you have a lot of makeup on, it might be worth cleansing first!) I massage the oil in for about 30 to 60 seconds, on all areas of my face. After that, I run a facecloth under hot water and wring it out. Making sure that it’s not too hot, I place the cloth over my entire face for 1 minute to “steam” my skin. After a minute, I rub the excess oil away using the warm, wet cloth to gently exfoliate and remove makeup. Afterward, my skin is left glowing! This method is quite hydrating for the skin. My take: Oil-cleansing is something I showcased on the blog many years ago, and several years later, I still enjoy it. The process is more time-consuming than regular cleansing (think 3 to 4 minutes versus 1 minute) so I don’t do it as often as I would like, but I try to fit it in a few times a month. Oil cleansing is great to do before bed—I find the leftover oil on my skin is a wonderful overnight moisturizer! My take: Cleansing with raw honey leaves my skin quite soft. I was skeptical when I heard about this method, but it is a fun change. If I have time, I like to leave the honey on my face for 5 minutes as a mask before rinsing it off. It’s a good mask to put on before a shower, as you can leave it on while showering and rinse it off just before getting out. About this product: This alcohol- and fragrance-free natural astringent tones and soothes skin, and can also be used to help with common skin care issues like blemish control, insect bites, mild sunburns, and varicose veins. My take: I’m going to warn you, pure witch hazel smells pretty horrible (in my humble opinion), and you can probably tell by now that I try to avoid products with perfumes. So, I try to dilute its strong smell by adding essential oils (shaking before each use); right now I’m adding lavender essential oil as it’s great for calming the skin. I use this toner at night after cleansing, when I want to make sure I’ve gotten all my makeup off. (I don’t find I need to use it during my morning routine.) Just pour a bit onto a cotton pad and wipe away! About this product: Made with French rose clay, this hydrating face mask has a gentle cleansing action, drawing toxins and oils to the surface to be washed away. Meanwhile, the mask’s exfoliating and polishing properties increase circulation to diminish inflammation and puffiness. My take: This was a random find at HomeSense (HomeGoods, if you’re in the US), but I really love it! Even though it’s a moisturizing mask, I find its main benefit is brightening the skin. I love to follow it up with the Andalou Naturals Rosewater Mask below. I try to do a moisturizing treatment every week or two, as my skin is naturally on the dry side. This mask has sort of a strange mousse-like texture that spreads into a thick cream once on the face. I find there’s some tingling when rubbing it on my skin. After about 10 to 15 minutes the mask is nearly dry to the touch, and then I wash it off with a washcloth or sponge. My skin looks brighter, tighter, and smoother after using it! About this product: This mask features alpine rose stem cells to deliver deep hydration that soothes and nourishes your skin. Meanwhile, the natural properties of pomegranate work to tone and tighten, and aloe vera and hyaluronic acid combine to refresh your skin’s moisture barrier. My take: This was another random find at HomeSense (did you know they have a natural products section?! It’s pretty fun!). As I mentioned, I use this mask after the Zion mask whenever my skin is feeling dry and looking dull. 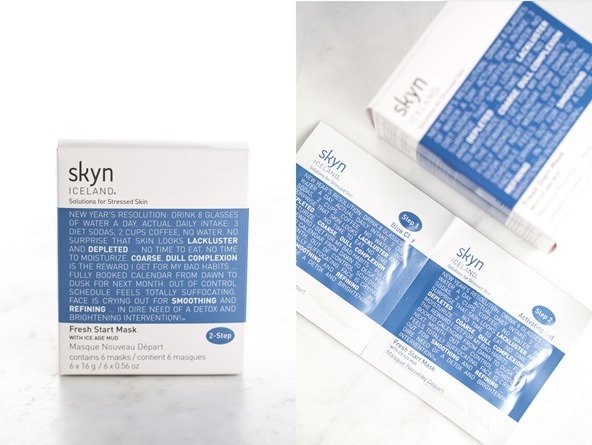 About this product: This two-step facial treatment detoxifies and brightens skin to retexturize, diminish dullness, and fight the signs of aging. In just 10 minutes, it polishes away dry, dead skin to reveal your natural glow. It tingles and feels quite warm when on the skin, so it may not be the best choice for sensitive skin. My take: This mask isn’t what I would call life-changing, but it is a decent “refresher”. It makes my skin a bit more bright, smooth, and even. About this product: This professional-strength resurfacing system smoothes and brightens the look of skin. 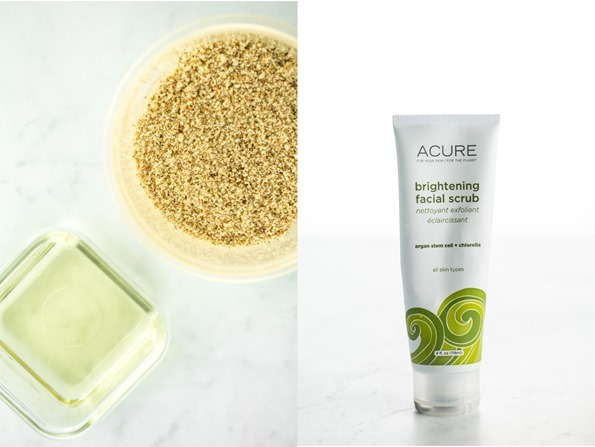 It’s an at-home three-step AHA peel and microdermabrasion process: Almond Polish Facial Scrub, Instant Transformation Lemon Facial Peel, and Chamomile Comfort Mask. (Don’t be fooled by these natural-sounding names, though; this product contains a lot of chemical ingredients.) It can cause a lot of redness and irritation, so may not be suitable for sensitive skin. 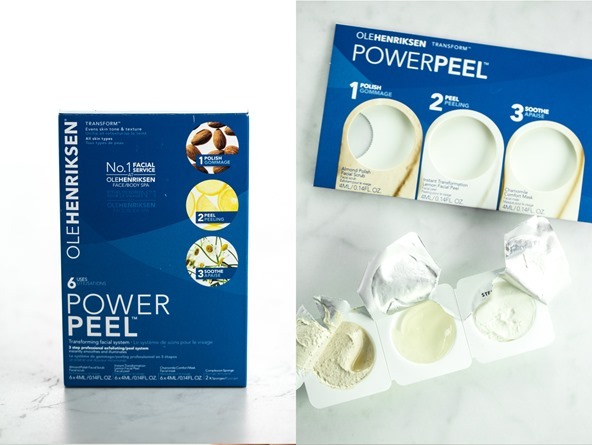 My take: This peel leaves my skin looking bright, glowy, and super refreshed. The results are dramatic. My skin usually has a lot of redness immediately after using this peel, but I use it at night and the redness is gone by the time I wake up. Due to how strong this product is, I recommend doing a test patch before a full application. Since peels tend to make skin photosensitive, I’m super careful to wear a lot of sunscreen on my face the week after the peel (and a hat when outdoors…always! ), and I avoid using it during the summer months. I also don’t use it while pregnant or breastfeeding. Pro tip: There’s quite a bit of product in each treatment and I find that you can get two applications out of a single treatment. So, if you have a roomie or family member, it might be fun to split it with them and do the mask at the same time. I’m not super loyal to any single serum or oil product right now. I like to try new ones often, and I’ve tried a lot (many of which I left out of this post because I felt like the higher-end options weren’t any more effective). It seems like most of them tend to do a great job at locking in moisture and creating a subtle glow! You can apply them directly to the face, or add a few drops into your regular moisturizer. In the summer, I tend to only use facial oil and serum before bed, and not in the morning, as I don’t find my skin needs extra moisture. Here are some I currently have in rotation. About this product: Lightweight and suitable for all skin types, plant-derived squalane is an outstanding hydrator; its emollient properties help prevent loss of hydration and protect skin’s suppleness. Squalane can also be applied to hair to protect against heat damage, boost shine, and reduce breakage. 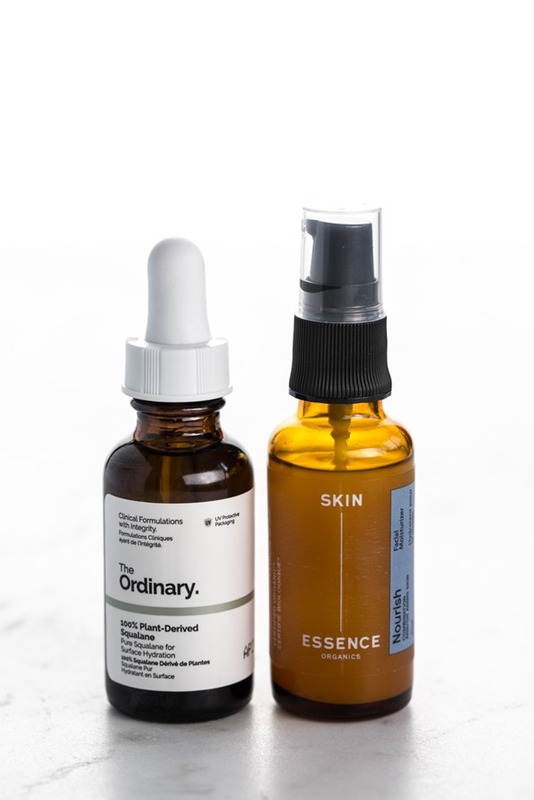 My take: I still can’t get over the amazingly low price points for The Ordinary’s skin care products (and their parent company, DECIEM, is Toronto-based, too). This is the first product I’ve tried from this brand, and I’m really pleased with the quality (and it’s $7.90 CAD, to boot). I like to use this plant-based squalane in rotation with my serums and oils. I put it on immediately after washing and toning my face to help lock in moisture. About this product: The wide variety of nutrients in this serum naturally tone skin for a bright, youthful glow. Rosehip and neroli help nourish and rejuvenate, while vitamin C stimulates collagen production to improve elasticity. My take: This is another lovely facial oil from a Toronto-based company. It has quite a strong citrus scent (thanks to the orange oil, I believe), so if you’re opposed to strong-smelling citrus scents it’s probably not the right oil for you. I don’t mind it, though, and find it pretty uplifting! I also find that this product can sting the eyes a bit (my guess would be the orange oil again), so I have to be really careful not to rub it over my eye area. About this product: This product is 100% pure cold-pressed Moroccan argan oil—fragrance-free, alcohol-free, and undiluted by other ingredients. Loaded with vitamins A and E and high in anti-aging plant squalene content, it helps repair skin and offers all-day moisture protection. 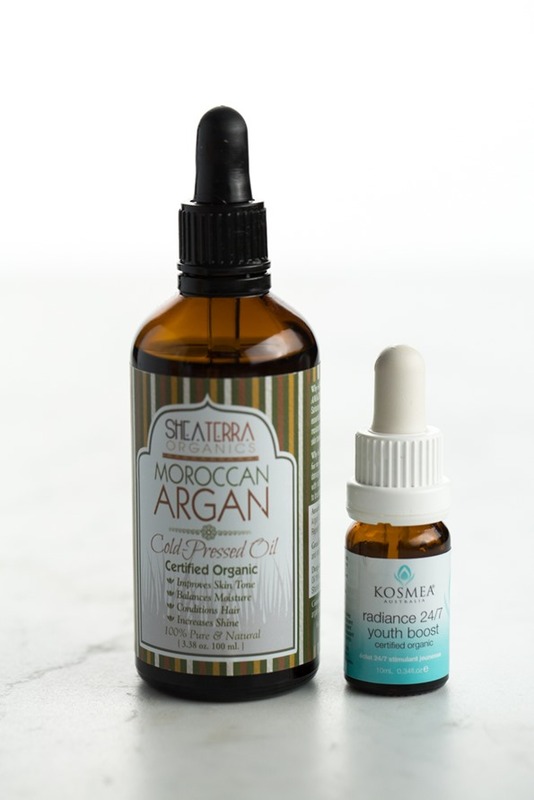 My take: I love that this argan oil is certified organic, unrefined, and cold-pressed. It was important to me to find a pure argan oil (without any other ingredients), and as far as I can tell, this one fits the bill. The bottle is generously-sized (100 mL, which seems giant next to my serums), so I feel like I’m getting a good value. In the evening, I gently rub several drops of this oil into my face before using my overnight moisturizer. (I don’t tend to use it during my morning routine unless my skin is really dry.) Apparently, you can also use this on the ends of your hair and cuticles, but I have yet to try it. Be warned that unrefined argan oil has an earthy—and to some, off-putting—aroma. I don’t notice the smell after applying my evening moisturizer on top, though. About this product: Harnessing the power of camellia seed oil and lemongrass, this fast-acting, sunny-hued serum works to restore your skin’s natural glow. About this product: This face cream is lightweight, but oh, so rich. It’s fast-absorbing, sinking deeply into your skin to provide abundant hydration and glow. Meanwhile, 100% pure argan oil nourishes your skin with essential fatty acids and vitamin E, and a blend of watermelon seed oil, shea butter, and fresh cucumber extract softens and smoothes. My take: I apply this after my facial serum or oil each night. I try to let it absorb for 5 minutes before going to bed, just to make sure it doesn’t rub off on my pillow. I always buy the unscented version and I’m so glad they offer this option as I’m not a fan of fragrances/perfumes. I’ve gone through a couple of jars of this face butter already, and will definitely keep buying it! About this product: This lightweight, fragrance-free sunscreen provides broad-spectrum mineral-based sun protection, while also strengthening and repairing skin with the aid of soothing anti-irritants and antioxidants. It provides a shine-free finish, and works wonderfully under makeup. My take: I can’t tell you how many natural sunscreens I’ve tried over the years, only to be disappointed. This has been my go-to for the past several months. I quite like it, and love that it doubles as my daytime facial moisturizer. It’s not too thick or goopy like a lot of sunscreens I’ve tried in the past, and it doesn’t leave quite as much white residue on the skin after application (although it does leave a bit, which goes away once absorbed). After cleansing in the morning, I apply this sunscreen, rubbing it all over my face, neck/décolletage, and tops of my hands. I let it soak in for a couple minutes if I can, and then proceed with makeup (if applying). About this product: This aerosol-free spray sunscreen provides broad-spectrum, water-resistant sun protection. It’s also paraben- and phthalate-free, and contains no synthetic fragrances. My take: While this is a “kids” sunscreen spray, our whole family is hooked on it and it’s all we use (except for the facial sunscreen I personally use, above). My daughter loves that we don’t have to rub a thick cream into her skin (one of her biggest nightmares!). You can’t beat how fast a spray is, and I love that it uses no chemical or flammable propellants! It does leave a sticky residue on my hands after rubbing it into the body, so I recommend lightly rinsing your palms with water after use. 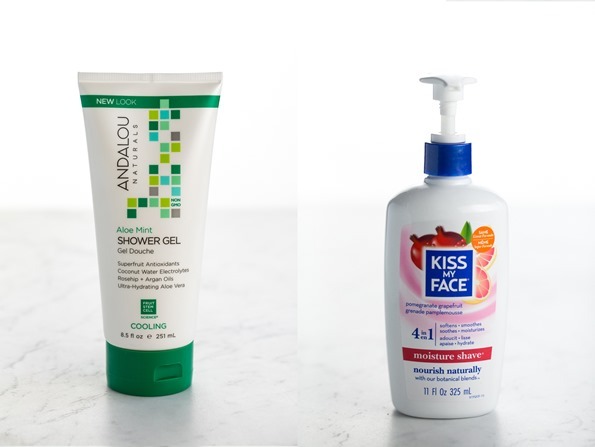 About this product: Andalou’s body lotion hydrates and replenishes skin to nourish, soothe, and soften. It comes in a variety of fun scents. My take: I’m OBSESSED with this brand of lotion, and I adore this Aloe Mint scent (it’s so cooling and I love using it after a workout and shower). I’m also in love with the Mandarin-Vanilla–scented lotion. I like that the cream isn’t too heavy; it feels light while still moisturizing well. About this product: This detangler contains things like shea butter, jojoba, and quinoa proteins to naturally soften, nourish, and strengthen your hair. My take: I originally bought this one for my daughter, and then I ended up buying it for myself, too. I use it after each shower as a leave-in conditioner. I don’t think this product is a miracle worker, though, as I find I still have some tangles after using it. 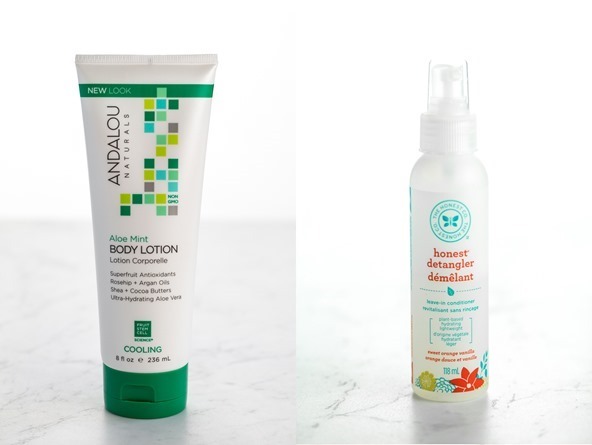 So you could say I’m on the hunt for a new detangler (feel free to share your recs if you have any!). About this product: This shower gel not only cleans, but also conditions by blending emollient-rich rosehip oil with coconut water and gentle, cleansing botanicals. They have an amazing variety of scents, too. My take: This is my go-to shower gel right now. It suds up very nicely, and I love the candycane-like “Aloe Mint” scent! About this product: This moisture-rich shaving cream is packed with natural ingredients like vitamin E, lemongrass, aloe, and olive and coconut oil that help soothe and soften skin, providing a smooth shave. It’s also paraben- and phthalate-free. Simply lather with wet hands, apply, shave, and rinse. My take: This shaving cream has the consistency of a creamy liquid hand soap. Weird, right? At first I was skeptical since I’m used to shaving foam, but I really love it. It suds up a lot and leaves the legs soft after rinsing. I love the Pomegranate-Grapefruit scent as it’s pretty energizing…no surprises there! About this product: This coconut-flavoured lip balm does it all: it moisturizes, smoothes, and adds a beautiful pop of glossy shine. Formulated with anti-inflammatory and antioxidant properties that soothe and hydrate, as well as an emollient that imitates your skin’s naturally occurring omega fatty acids, this lip conditioner/gloss stands out from the crowd. My take: This is my favourite 2-in-1 vegan lip conditioner and gloss! I love how healthy it makes my lips look and feel. It’s glossy and leaves a noticeable shine, but doesn’t feel gunky (as long as I use just a tiny amount…a little goes a long way with this product!). About this product: This gentle hand wash works up a beautiful lather that, thanks to an argan oil–rich formula, nourishes and moisturizes as it cleanses. Thanks Taylor!! Going to check those brands out. And you’ve reminded me about 100% Pure…I’d like to try out more of their products as I haven’t tried many. You might like to try any of John Master’s Organics detangler/leave-in conditioner. They work really well, but at almost $30/bottle I found I was going through them too quickly. Still an amazing product. You would love Limelight by Alcone products! They are 100% nontoxic, leaping bunny and organic certified, and affordable! Thanks for your line up! While Tata Harper is expensive I most recently tried the sample kits from Sephora and of course fell in love – figures! They are local-ish for us (I live in western NYS) in Northeast US and use amazing ingredients. I love the purifying cleaner and purifying mask. I also just recently tried the Beautycounter #3 balancing oil and it has made the world of difference to my skin in the two months I have been using it (I do not sell or know anyone personally who uses it either, I just found it through researching what would help my combination skin). I have also used the Acure scrub you use but found that ARCONA cranberry gommage works a little better for me and it smells amazing. I do the same thing in that I leave it on a few minutes like a mask before taking it off. Thanks for your recommendations! I’ve heard good things about that Tata cleanser. Have you tried their oil cleanser before? 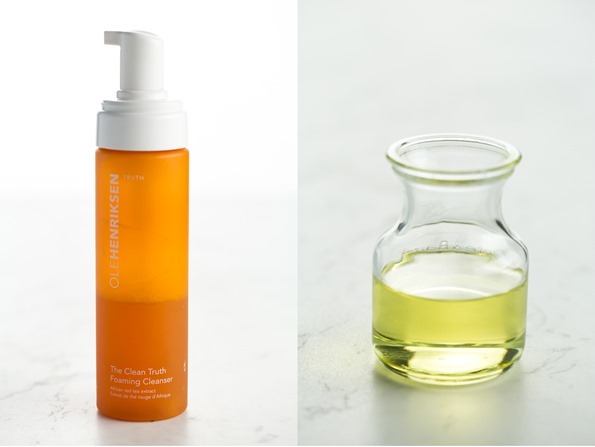 Yes, all of their cleansers are oil based and before I used this one I was using an oil-based cleanser from Australian Scent, a small family-owned business out of NYC (they also have amazing products!). I recently re-purchased the Tata Harper “Purifying Cleanser”, although I have also tried their “Nourishing Cleanser” too which is a nice oil-cleanser. I have combination skin so the purifying works a bit better for me. You apply it to a dry face, rub it in and let it sit for a few minutes and than it washes off everything (makeup too!) with a warm washcloth. 1) You mention your favourite detangler, but I’m wondering about your other favourite hair products? You always have great hair! I know how hard that is in an Ontario summer. 2) Have you ever tried a chemical exfoliant instead of a scrub? I discovered them a few months ago. Exfoliants make my face angry and red, but chemical ones (I use Paula’s choice’s acne stuff) seem to do the trick without drying my skin. 3) Thanks for the honey suggestion! Will give it a try. I make most of my own beauty products and love using raw honey as well! I also really like a lemon honey scrub. A really great Canadian brand is Green Beaver – I got a friend to bring a dozen tubes of their toothpaste to Germany for me in May because I couldn’t find any other toothpaste I liked as much! 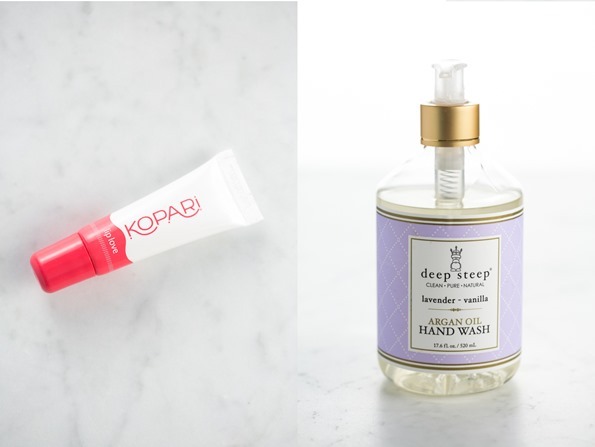 Would you mind sharing where you found the Kopari lip balm? I attempted to order through their website, but got an error message saying they don’t ship to Canada. My absolute favourite products are the Everyone line. They are so multipurpose and definitely streamline your bathroom cupboards. We use the soap for hands, kid soap / shampoo, and bubble bath. We all use the moisturizer, and I even use it on my face instead of the fancy $$$ face cream I used to use. I used to feel the same way about Everyone products. I tried a liquid handsoap and thought it was the bomb! Went to their website and discovered they seemingly make “everything”! I bought shampoo, conditioner, body lotions, face wash, exfoloant, facial moisturizer. I liked about 30% of the items that arrived. Using them anyway, but one night as I was using the face wash it occured to me that Everyone was NOT all it was cracked up to be. Under ingredients it lists “sourced internationally” or some such disclaimer. Its NOT leaping bunny approved… I think the ingredients are probably soirced in China… I did write the company a letter asking this specific question and I got a replyna few days later saying that they trust their suppliers are honest so… I don’t feel like that really made me feel confident that my exfoloator wasnt rubbed into a caged rats eyeballs or spme such atrocity so…. Im using it all up as fast as I can and am actovely searching for a DEFINITELY CRUELTY-FREE Brand to support. In the past 6 -9 months, I’ve done a total overhaul of my skincare. As products ran out, I would replace with items that seem to fit with your overall philosophy; mostly a mix of items bought at a local shop that specialises in natural/organic/vegan, Whole Foods (waited for sales) and Deciem brand products. 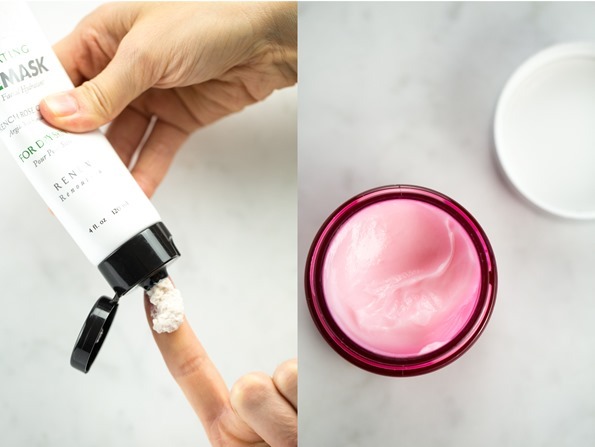 I’ve been super pleased with my new regime– I have mixed and matched lower price point items from Deciem with higher price point items (moisturizer!) from the local shop. Thank you for posting this!!! I have been hoping you would do something like this. It is so hard to find options for great vegan friendly products and a lot of the people that recommend product do so because they are getting paid to. Thank you so much!!!!!!!!!!!!! Can you blog about your favorite household products?? Thank you for all you do, you are amazing! Anything by kiehls is amaaaazing. The best scrub I’ve ever had has been their microdermabrasion. I’ve never had a line of products work as well as theirs tho…. unless your looking for vitamin c syrums or retinal stuff… go to dermatologist cause you can get better stuff than they can sell you in regular stores. Thank you so much for sharing your recommendations! I live in Tucson, Arizona, and am always looking for ways to moisturize my skin. Can’t wait to try some of these :). Hi Shelby! I live in Tucson!! 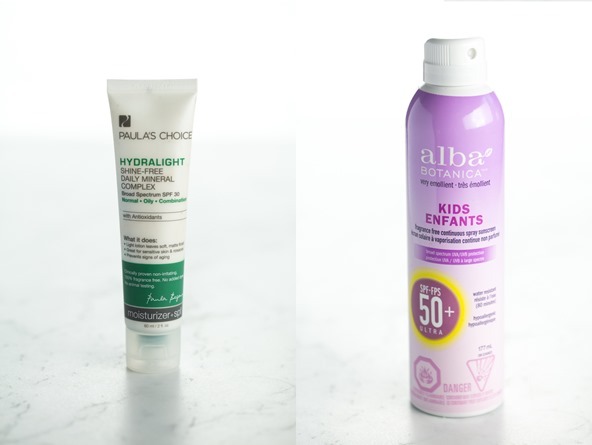 * Paula’s Choice AHA and BHA treatments (for when summer sweat breaks me out. I heard that these might be cruelty-free? but I’m not sure – do a double check). 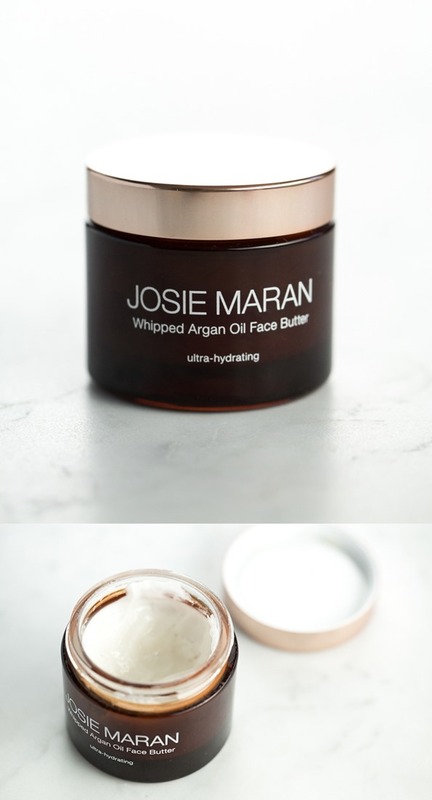 Hey Shannon, I’m happy to hear that you enjoy Josie Maran’s whipped face butter too! I just love it. Thanks for sharing! Great list! Thank you for sharing. Have you tried LaVigne Natural Skincare? I’m allergic to beeswax and this is the first lip balm I’ve found that doesn’t irritate me – it’s a lifesaver. Their Mayan Magic cream is also really lovely. Thanks again for all your reccos! Not sure if my recco’s will meet your vegan/ethical benchmarks… but, for a fantastic shampoo/conditioner/detangler, Hair Story’s New Wash has been amazing (but super $$$$). For lip balms, I swear by Desert Essence lip rescue with tea tree oil. Doesn’t smell great but it healed my winter crackled lips when nothing else could. Can also double as spot treatment on mosquito bites in the summer! Shaving cream…. long time ago I learned that conditioner can be used in place of shaving cream, works great, one less product to buy. Hey Nancy, Oh I love Dessert Essence. You’ve reminded me how long its been since I tried out their products actually. I’m really curious about that lip balm..sounds amazing. Thank you, Angela, for sharing these products! I would definitely recommend 100% Pure (especially Yuzu and Pomelo Glossing Shampoo and Conditioner and Blood Orange hand buttercream). I also like Pure Haven Essentials products. I would NOT recommend Arbonne because it misleads people by saying it’s vegan, but if you look at the ingredients list, there are many ingredients that are on safety watchlists as potential allergens and cancer-causing chemicals. Thanks Susie, I’m super curious about 100% Pure’s line of hair products. I have only tried a couple of their makeup products, but that was years ago! Thanks for this list Angela! I have been using Rocky Mountain Soap Company toner, serum and moisturizer for a few years now and I cannot say enough good things about the brand. And their deodorant is the only natural deodorant that does not leave me smelling like a gym bag by the end of the day. They are based in Canmore, Alberta and they truly are a Canadian gem. I did however recently order a Farmacy sample kit from Sephora (you know, just to change things up a bit) and their Invincible Root Cell Anti-Aging Serum is kind of amazing, especially for dark spots. As a side note, this is the first time that I have commented on anything…ever…and I just want to say that I discovered your site before my transition to veganism a few years ago and you were the hugest inspiration to me during that time. Thank you for what you do. Hey Joelle, Thank you so much for your kind words! That’s so awesome you love the blog and recipes so much…I’m honoured! Thank you so much also for your product recommendations. I’ve heard great things about Rocky Mountain!! I currently use Shea terra black seed oil. I love it and the smell is amazing and no reaction. Thanks for sharing some of your favorites! Carina Organics, a Canadian company, seems to be a good company. My husband and I have started using their shampoo and liquid hand soap, and like the baby shampoo/body wash for our little guy. They strive to make toxin-free, affordable products, many of which are vegan and cruelty free, using mostly (if not only) organic, sustainably sourced materials. You might check them out, if you haven’t heard of them. Great post! I wanted to mention Calia shampoo and conditioner, its a Canadian company with good, clean ingredients and essential oil. My hair has been quite dry and falling a lot and I had read a lot of reviews so I decided to give it a try. It’s been amazing for my dry hair, I got a bundle deal but have only tried the rosemary shampoo+conditioner. I love that the conditioner doesn’t make my hair greasy after a few days like the other conditioners did. I also got their leaver in conditioner that I use after shower as well as a detangler for my daughters hair. Best wishes from Northern California. Hey, thanks so much for the hair care recommendations! I haven’t heard of this stuff before, but now I’m super intrigued. I’ll definitely look into it soon. :) So glad to hear that it’s worked so well for you. Great post! I love trying new face serums too and have never tried the skin essence brand. Will definitely try it! Thank you!! I bought the night cream and the lip gloss per your recommendation and I love them both!!! As a breastfeeding mama and with the dry winter my skin has been in need of some TLC. Thank you so much! Any ideas for a dry scalp? Thanks!! Hey Lindsay, Oh I’m so glad you tried them..I use them daily and really have nothing bad to say about them. Well the only thing about the lipgloss is that I find it becomes hard to squeeze out of the tube when it gets low. lol. I don’t have anything to recommend for a dry scalp, but maybe someone else can chime in? Aww thank you Lindsay! I’m so happy you’re enjoying the blog. Love your list. You should pop into a Pure and Simple spa. Locally owned and all cruelty free products. My favourites are Holistic Vanity Cleansing Oil, Naturpathica Calendula cream and the vitamin K eye cream. I love their Holistic Vanity exfoliating milk and their collagen serum. For oils I am using, not from them, but Drunk Elephant facial oil from Sephora. I don’t work for P&S, just a loyal 10 year customer. They give out very generous samples and are an absolute joy to visit in their spas. A lot of their lines are vegan, my new favourite sunscreen is made by Coola and they have a baby one in their line. I work at whole foods and have tried everything there lol. The one i continue to use is Evan Healey…blue lavendar cleansing milk, toner and serum. Its freakin expensive but i buy when on sale and get employee discount too so its not too bad. Its so calming in my sensitive skin , my skin jas never looked better! Badger cleansing oil is a good one too and much more affordable! Love this post. Thank you for sharing. I have been using and loving Eminence skin care products for a while now and love them. And the Allseeing eye cream by Living Libations which is a Canadian company. This one smells amazing and is all natural. Thanks for the product rec Aimee! You might want to try Riversol skin care line developed by a dermatologist at UBC , Vancouver, BC. I have used this line for a year now and love it. They offer a free sample kit so you can try their products. Wonderful company to deal with, you can phone them any time and ask questions. I love Skin Essence products – I use their cleanser, rosehip seed oil, and masks. I’ve also used their green cream for eczema. I like the Acure toner. Mad Hippie also has great products! I love using the Dr Bronners shaving lotion – it works great!